Break out those bobby socks and school sweaters! 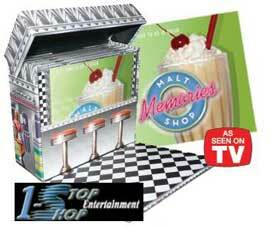 Your favorite 50s Music is here in this special Malt Shop Memories collection, packaged in a nifty collector’s box. Jitterbug to 150 jukebox classics by the Four Seasons, Dion and the Belmonts, and many more! Including lyrics for all 150 songs!